Former U.S. Marine Paul Whelan, 48, was arrested Dec. 28, but his detention wasn’t publicly announced by Russian intelligence until Monday. The case remains mostly opaque, save for unverified reports from a Russian news outlet, said to be close to the security services, that alleged Whelan was caught in his hotel room with a removable memory device with a secret list of Russian government officials. The reports also claim Whelan had been involved in intelligence activity for 10 years, including using social media to attempt to recruit Russian sources before traveling to Russia to meet them. 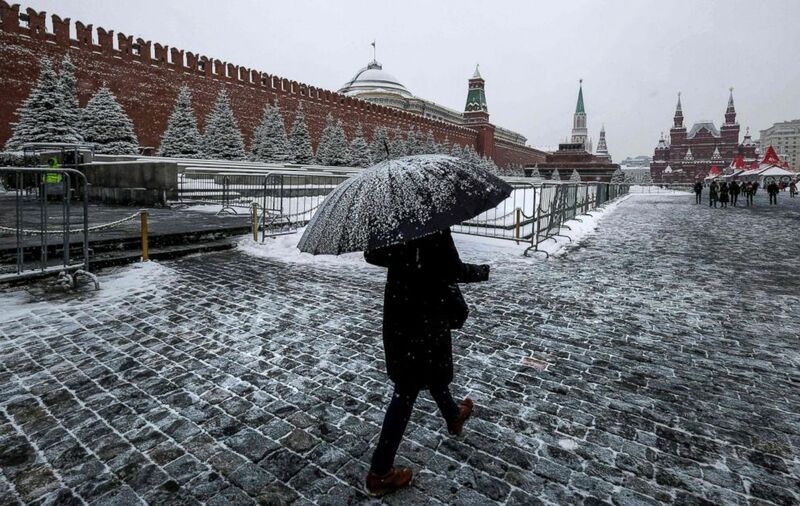 A woman walks on Red Square past the Kremlin after a night of heavy snowfall in Moscow, Dec. 6, 2018. The purported circumstances of Whelan’s arrest and such espionage methods, described in the Russian reports as “unorthodox,” seemed suspect to several former U.S. intelligence officers, including John Sipher, an ex-CIA official who once ran the agency’s Russia operations. He told ABC News it’s “highly unlikely” Whelan, who is chief of security for a large automotive parts company, is a U.S. intelligence official. Sipher said, for instance, he strongly doubts a U.S. spy agency would send an officer into such a difficult and dangerous espionage environment as Moscow without the benefit of diplomatic immunity, which is afforded to accredited U.S. officials, some of whom are undercover spies. The U.S. has not claimed any such immunity for Whelan. While much about Whelan’s actions leading up to his arrest remains unknown, another veteran CIA official, Steven Hall, said that could be beside the larger point. “This is all about Butina, leverage and reciprocity,” Hall wrote on Twitter, echoing comments he made to The Daily Beast after Whelan’s arrest was announced. Hall was referring to Maria Butina, the Russian gun rights activist arrested in Washington, D.C., in July, who in December pleaded guilty to a conspiracy charge related to her work as an illegal agent of the Russian government. She was not accused of attempting to steal secrets like a traditional spy, but of infiltrating conservative groups to boost the Russian government’s agenda. 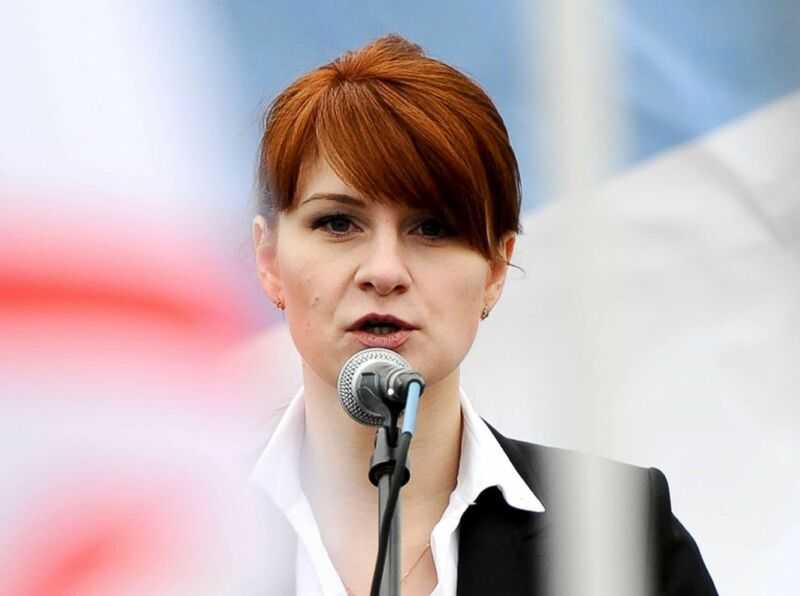 The Russian Foreign Ministry has described Butina’s prosecution as a witch hunt and called her a “political prisoner.” Like Whelan, Butina was active on social media and open about her contacts with foreigners. Baer said the unusual nature of both cases was probably not a coincidence. “If [Russia] could find an identical case to teach us a lesson, they would. But they would take something short of that,” he said. “It’s a powerful message,” Joyal said. As to whether an actual exchange is in the cards for Butina or other Russians held in the U.S., there’s been no official indication that those kinds of discussions have been proposed. A former senior intelligence official, who requested anonymity to discuss an ongoing case, was skeptical that a traditional prisoner swap could happen currently, considering the geopolitical and legal complexities on both sides of the Atlantic. Butina’s plea agreement notes that the conspiracy charge carries a maximum penalty of up to five years in prison, but the deal could see her receive a lesser sentence, depending on the level of her cooperation with the U.S. government, before likely being deported back to Russia. Whelan reportedly faces up to 20 years if convicted on espionage charges. The ex-official and Baer said it remains to be seen how, if at all, Whelan’s arrest could affect Butina’s case or any cases that could grow out of her cooperation. An attorney for Butina declined to comment for this report. A State Department official declined to comment further.